This is Oliver Tate's (Craig Roberts, Becoming Human, TV), view on life, his monologue on how life is shite and how the planet holds nothing for his hopes and dreams,(typical 15 year old, me thinks). His aspirations are that he must save his parents failing marriage and crush her aspirations for getting back with her first love who appears next door, and loose his virginity before his next birthday. The later has his hopes pinned on the lovely Jordana Bevan (Yasmin Paige, Ballet shoes 07) who is his class mate and he spends a lot of his time day dreaming about her. His wishes come true that she becomes his girlfriend and they embark on a strange relationship of petty arson, bullying and sexual exploration. His parents Lloyd and Jill Tate, (Noah Taylor, Charlie and the chocolate factory 05, Sally Hawkins. Made in Dagenham, 10). don't help his plight by their lack of affection for each other and this takes up the other 40% of his mental processes and he knows a lot about there affections or not for each other, as he takes notes on everything. The directors (Richard Ayoade, Moss from I.T. crowd) use of 35mm and super 8 camera for the dream and memory sequences is a very nice touch and gives the film a warm familiar glow to it, as well as bring those teenage angst years back to those with more experience. A very good film for all, but more likely to watched in a messy, dirty and smelly bedroom with bottles of acne cream littered about than in the front room with the rest of the family. 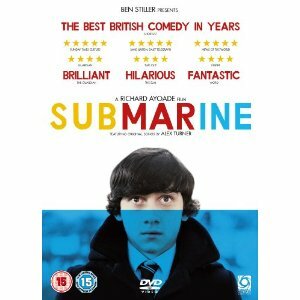 A great Welsh film and it will do the British film industry a power of good. Out on DVD and Blu-ray 1 August.